A student representing Rotolo Middle School recently received a perfect score in the first of three meets in this year’s WordMasters Challenge,™ a national vocabulary competition involving nearly 150,000 students annually. 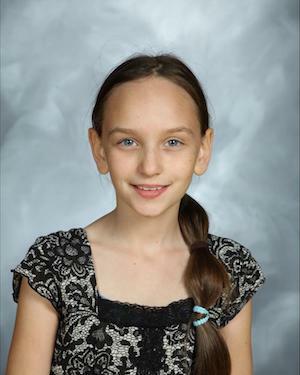 Congrats to RMS student Anna Green for receiving a perfect score on the WordMasters Challenge™! Competing in the difficult Blue Division of the WordMasters Challenge, sixth grader Anna Green earned a perfect score of 20 on the challenge. Nationally, only 67 sixth graders achieved this result. Other students from Rotolo Middle School who achieved outstanding results in the meet include sixth graders Molly Autenrieth and Gemma Cohen. The students were coached in preparation for the WordMasters Challenge by the RMS 6th-Grade ELA Department. The WordMasters Challenge program is administered by a company based in Indianapolis, which is dedicated to inspiring high achievement in American schools. Further information is available at the company’s website.